Raco Verd is one of the Ibiza Villas Direct team’s favourite eateries on the Island, and that’s why we are really looking forward to their opening in March. Conveniently located on the main road opposite the church in San Jose, providing something for everyone and even a bit of shopping! The Raco Verd venue comprises a café/restaurant, juice bar, bar, shops and is also a live music venue. The large space comprises pretty covered terraces for dining along with chill out/lounging areas with comfortable sofas to enjoy a beer or a cocktail; a really relaxing environment with a performance space. 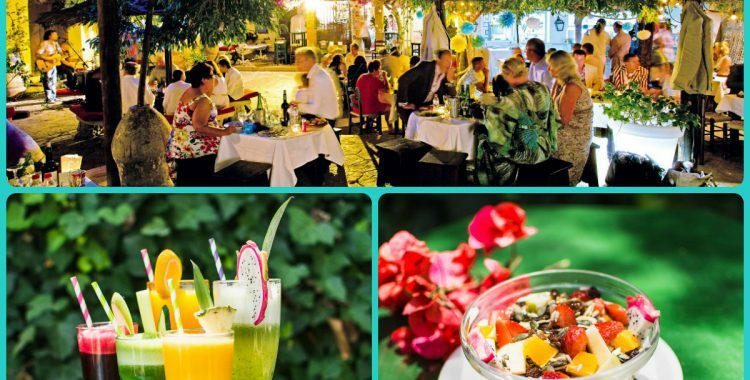 Regular appearances by live bands makes it a perfect spot in San Jose to enjoy mouth-watering food, fresh juices and cocktails whilst enjoying fabulous music acts. The kitchen provides delicious Mexican and Spanish specialities with vegetarian and vegan options; healthy snacks; breakfasts and a wide variety of tasty juices from the juice bar. There really is something delicious for everyone. This year Raco Verd will be opening their own shop offering clothes from local designers in Ibiza, a selection of the famous Pacha brand, sunglasses, luxury Ibiza beachwear and a great selection of gifts from the island and Mexico. With over one hundred music nights booked per season, take a look at their Facebook page to see who will be performing each week. Juice Bar/Live Music Venue/Terraza Bonita/Tapas & Comida Mexicana/Cocteles & Gin Tonics de Lujo en el centro de San Josep.